Why started in certain places: In this article, we have tried to answer: Why did the ancient India civilization start in certain places? What was its significance? The Indus Valley Civilization or IVC as it is commonly referred to as an ancient civilization thriving along the lower Indus River and the Ghaggar River-Hakra River which is in the present day and western India from the 28th century B.C.E. to the 18th century B.C.E. Another name for this civilization is the Harappan Civilization of the Indus Valley, in reference to its first excavated city of Harappa. The Indus Valley Civilization stands as one of the great early civilizations, alongside ancient Egypt and Sumerian Civilization, as a place where human settlements organized into cities, invented a system of writing and supported an advanced culture. Hinduism and the culture of the Indian people can be regarded as having roots in the life and practices of this civilization. 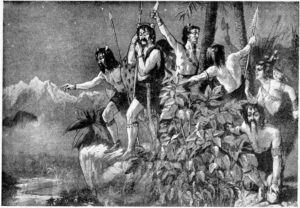 This was a flourishing culture, with artistic and technological development, and no sign of slavery or exploitation of people. The civilization appears to have been stable and its demise was probably due to climatic change. The Indus civilization was predated by the first farming cultures in South Asia, which emerged in the hills of what is now called Balochistan, Pakistan, to the west of the Indus Valley. The best-known site of this culture is Mehrgarh, established around the 7th century B.C.E. to be precise 6500B.C.E. 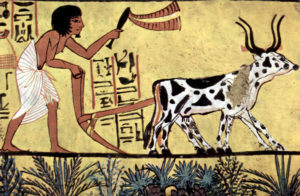 These early farmers domesticated wheat and a variety of animals, including cattle. Pottery was in use by around sixth millennium B.C.E. around 5500 B.C.E. The Indus civilization grew out of this culture’s technological base, as well as its geographic expansion into the alluvial plains of what are now the provinces of Sindh and Punjab in contemporary Pakistan. By 4000 B.C.E., a distinctive, regional culture, called pre-Harappan, had emerged in this area. Trade networks linked this culture with related regional cultures and distant sources of raw materials, including lapis lazuli and other materials for bead-making. Villagers had, by this time, domesticated numerous crops, including peas, sesame seeds, dates, and cotton, as well as a wide range of domestic animals, including the water buffalo, an animal that remains essential to intensive agricultural production throughout Asia today. Indus Valley was discovered in 1920 by R.D. Banerjee. By the 26th century B.C.E., some pre-Harappan settlements grew into cities containing thousands of people who were not primarily engaged in agriculture. Subsequently, a unified culture emerged throughout the area, bringing into conformity settlements that were separated by as much as 1,000 km and muting regional differences. So sudden was this culture’s emergence that early scholars thought that it must have resulted from external conquest or human migration. Yet archaeologists have demonstrated that this culture did, in fact, arise from its pre-Harappan predecessor. The culture’s sudden appearance appears to have been the result of planned, deliberate effort. Like for instance, some settlements appear to have been deliberately rearranged to conform to a conscious, well-developed plan. For this reason, the Indus civilization is recognized to be the first to develop urban planning. One of the scholars, Dr. Var’s work is extremely significant since it challenges the idea that the Indus Valley Civilization was pre-Aryan and that the Aryans invaded or migrated from the European zone. In the view of some Indian historians, such as N.S. Rajaram, no such invasion took place and the Aryans were indigenous to India. This alternative view to the “Aryan invasion” theory has been called the “cultural transformation hypothesis.” The distinction and idea of mutual antipathy between the darker-skinned Dravidians and the lighter-skinned Aryans were, according to Rajaram, a European invention to help legitimate their own rule, since they too were Aryans.